Good morning! Radio 4 is reporting that a bail-out deal has been agreed for Cyprus, which involves large bank accounts being raided by up to 40%. Well that's going to do wonders for confidence in the banking system isn't it?! Apparently accounts under E100k will not now be hit, but surely the damage has been done, in that they originally intended to hit those accounts too. It's like a burglar telling you that they intended burgling your house, but changed their mind at the last minute! You wouldn't sleep soundly at night, you would redouble your efforts to protect yourself & your assets. The only rational course of action now is for anyone with liquid assets anywhere in Southern Europe is to get them the hell out! So there must surely already be a massive capital flight going on, or maybe the money is long gone anyway? It strikes me that the end game for the Euro is capital controls being imposed in all the weaker Euro countries, and of course by imposing capital controls, they will effectively be creating new currencies - Cyrprus Euros, Greek Euros, Spanish Euros, etc, which are no longer convertible at par. Instead the free market will determine what the exchange rate is. People who left money in the weaker countries will be the losers as they devalue, and as usual Germany will be the winner. They may have lost the war, but they are sure winning the peace. The sooner the Euro, and the EU, are consigned the dustbin of history, the better, in my opinion. Both fit into the category of "seemed like a good idea at the time", but have just been poorly executed. Eurozone crisis after crisis has meant that the whole continent has failed to recover economically from the 2008 financial meltdown, when we should have been in a robust recovery by now if imbalances had been resolved through exchange rate adjustments. After funding unimaginably vast bail outs previously, the refusal to pump another E6bn into Cyprus on reasonable terms might turn out to be the straw that broke the camel's back? Paul, aren't you missing the obvious with Vislink (LON:VLK) re outlook? They reiterated in the statement today that they remain confident they will reach their end of 2014 target of £80m revenue and £8m adjusted operating profit. At the current price makes it look v.cheap if you believe management. As for Cupid (LON:CUP), no position but enjoying their strong rebuttal this morning. TW article about Cupid (LON:CUP) telephone number profits at the weekend was laughable. A sideline on Cupid. 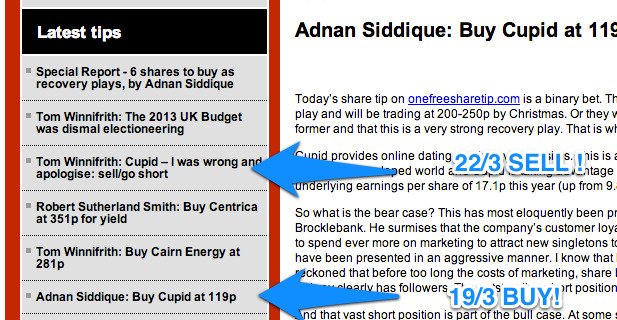 I find it quite extraordinary that the 'one free share tip' website told subscribers that Cupid was a buy on the 19th March, only for three days later to call it a sell. I guess you get what you (don't) pay for in life ! Indeed, I mentioned the £80m revenue target and £8m profit target in the last update, but probably wasn't there when you posted your comment. Although I would say the these targets are not obvious, because they are buried in the narrative, when they should have been in the outlook statement! It should also be mentioned that those targets are based on a mixture of organic growth and acquisitions. Although VLK has cash, so profitable acquisitions (if made at a reasonable price) would be a sensible use of that cash. I like it, and have bought a few this morning. It's been on my radar for a while. I am also using today's pullback to add here. Another positive to add to the list, is that this cash rich high dividend yielder is also ISA'able. Re. Cyprus. I think the EU ringmasters tried to experiment with Cyprus on new ways to solve the euro crisis, even contemplating letting Cyprus sink and leave the Eurozone. " Let's try it out on a country whose GDP is about the size of BT. If it doesn't work then no significant harm done." Cats will play with mice. Re: CUP - this is a fascinating situation. I do some work in the same City as CUP for another internet company. Our HQ is less than a mile away from their's and I know the company quite well. The rebuff today was quite good but I'm not that convinced by the business model in an area which is very very competitive. It could be that it is rouge "scammers" who have registered on cupid's sites and it is they who are responding to profiles who have not yet paid - effectively fishing for registered users on their behalf. The problem for me is that it seems very unlikely that CUP didn't know this was going on. It only took one guy at Bronte capital to register and expose this practice.  So if CUP were happy to allow this to go on because it increased their conversion rate they now face a problem. Either they continue to allow it (keeping conversion rates high) but run the risk of brand suicide or they stamp it out (hard to do and expensive) and run the risk of lower profitability and perhaps worse a loss making conversion rate. So for me there isn't an investment here either long or short. Thank-you for explaining the fee structure at Fairpoint. Helpful and informative. I've held SpaceandPeople for a year now, and they're up very nicely (54%). As part of my research I discussed it with the MD of our company - she mentioned that whenever she calls a shopping centre they seem to be the one who deal with exhibition space. I've looked at Fairpoint too, but I am concerned about the massive VAT refund they have. This was somehow channelled back into the company via IVAs. I don't fully understand it, but am concerned that this might have boosted profits and that this is a one off measure. Would love to hear your take on it. Indeed, Spaceandpeople seem to have cornered the market in their particular niche, which is usually good for investors. Fairpoint's VAT refund was mentioned on the conference call last week. Yes it is a one-off, so has been treated as an exceptional item in the accounts, which is clearly the correct treatment. I don't think there's anything more than that to it. As long as you regard it as a one-off, then it's not distorting the figures is it? r.e. Fairpoint I was struggling with the difference between the exceptional profits reported (4.5 million) and the amount received in the VAT refund (9 million), but re-reading it and your comments presumably the fee income will be ongoing, which should mean that the exceptional profits will be ongoing? r.e. SpaceandPeople, the share price is very volatile and does seem to create some good opportunities if you can stomach the bid/offer spread. The bid-spread put me off initially but when the share price dived I tucked in. Considering all Euro notes are the same, then capital controls could only be introduced by closing borders or preventing cash withdrawals. I recall from my conference call with mgt that a lot of the VAT refund was passed back to third parties (debtors or creditors, I can't remember). It's a lot simpler than you're making it! Fairpoint just made an exceptional gain, which is reported clearly at just under £3m from memory. That's it! So we should value the business on the normal profits, i.e. excluding the exceptional gain, which is what I did.